The room was in a building on the upper reaches of a hill in the Siddaganga campus. We entered it around 3:00 in the morning. The Swamiji and the junior Swamiji were already inside, they’d been there an hour or more. They were chanting and doing aarti with sambrani. Glowing sambrani had filled the place with smoke, and the pungent, pleasant aroma from the smoke fired the nostrils, shook the groggy brain. The two holy men moved with an urgency — like it was imperative they finish their divine works by sunup. I‘m saying men, but I may be forgiven: The senior Swamiji was revered as The Walking God, but in that moment before me he was himself worshipping God, and God will not worship Himself. The senior Swamiji had crossed into the nineties; his junior was in middle-age. We — my wife and I and my father and my mother — squatted on the floor before the holy men. A half-hour passed with the swamijis alternating between frenetic movement and silent meditation with the linga cupped in upturned hands. The senior Swamiji's linga was large and glossy and black, and it filled his palm. I squeezed my linga that I’d brought for him to consecrate; it was the size of playing-marbles. The swamijis ornamented their lingas with rose and jasmine and red hibiscus and pink oleander, and sprigs of bilpatrè, and vibhuti ash. The supply of flowers and leaf lay in heaps on large plates. Soon as they’d done the ornamentation the swamijis stopped the chanting, gazed in adoration at the linga they’d held up at eye level. In that pose they went into a trance and, waking shortly, they dropped the flowers and leaves into a bowl below, and washed the linga and ornamented it again with ash and leaf and flowers. They worshipped and washed and readied it for the next round. Round and round the pooja of linga went, and then when I was in my own trance, the senior Swamiji in one motion turned and moved toward me with two hops on his haunches. At 93, he was old in age only. I held out my linga, smooth and jet black with a flare on it from the oil lamp in front. He picked it up, asked me to finger-draw ash on my palm, pressed on the linga, smeared ash on it. His press was strong, firm, and my hand felt insubstantial in it. He made urgent signs to seat right the linga, and I, not knowing at age forty-one the right thing to do, fumbled. The junior Swamiji moved in to help. Now it was my turn to heap good things on my fresh-consecrated linga. And so I was confirmed a Lingayat, with my own Atma Linga to worship every day, or on special days, and wear it all the time, or for festivals — as I wished. The junior Swamiji leaned toward my ear and whispered a mantra — my personal mantra. I had to chant my mantra now, linga in hand, and count the chants with the free hand, on which the junior Swamiji dropped a red n’ white checked-cloth, to conceal the count from Evil’s eyes. 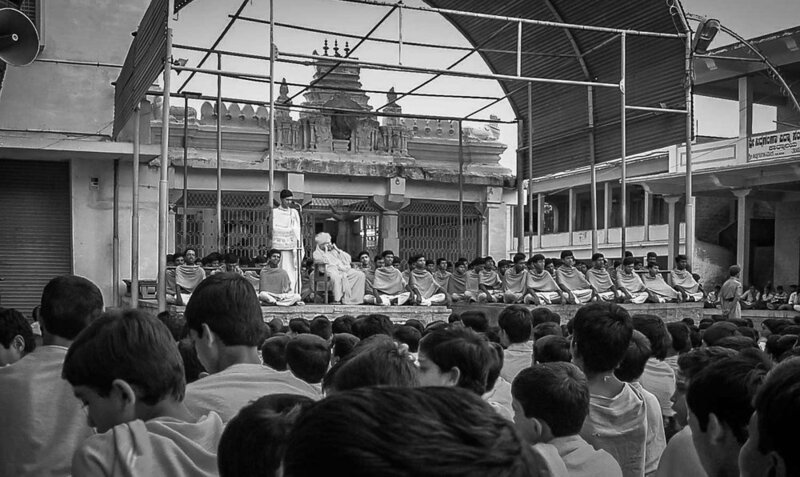 The Swamiji and his junior had more rituals to perform before winding down. It was a spiritual exercise the senior had been performing every night since 1941, the year he took charge of the Mutt, rising from bed at the hour many retire to sleep. The aromas of breakfast wafted in, of curried spice, signalling the end of the night’s labours. Idli was served, and chutney and sambar and uppittu: Simple Southern fare, from the Swamiji’s kitchens, and it tasted divine. Finishing their portions, the swamijis poured water into their thalis, washed them, and drank the wash. Not a grain had been wasted — food was prasāda, God’s gift, to be revered as such. When we stepped out daylight had broken over the brown and green and hilly terrain of the Mutt. A few hours later, I sat in the Swamiji’s capacious room with my father. Wanting to fetch something, my father went out. Now I was alone with the Swamiji, an opportunity available only for the rich, and powerful — not for folks like me. The Swamiji's eyes were closed, but after a while he woke and saw me. I rose and knelt before him. He said something in a mumble that I didn’t hear. I noticed my eyes going moist. The Swamiji went back to dozing. Sujaya heard first the news of his death last week. A holiday was declared. Hundreds of thousands of people left town for his mutt sixty-five kilometres away. (Fifteen makeshift helipads came up near about the mutt — in anticipation of big-shot devotees.) In my workplace, colleagues asked if we could observe a minute’s silence. “He was not just a religious leader. He was a social reformer,” one argued. The Stranger. The Camus I read long ago is nagging my mind.